Yorkshire terriers are notorious for barking. They are small dogs with a big attitude. Yorkies are territorial, which means they feel the need to guard their home against intruders. This innate need will often cause them to bark at the smallest noise. Many people who live in apartments purchase a Yorkie because of its small size and high intelligence, but then they often have problem of the dog barking. There are several ways to reduce your Yorkie's need to bark. Fill a hand-held squirt bottle with 25 percent lemon juice and 75 percent water. When your Yorkie barks, squirt it in the face. Dogs do not like lemon juice in the face. You can also mix a combination of 50 percent water and 50 percent white distilled vinegar in a spray bottle to use. Try both mixtures to see which works for your Yorkie. Fill a soda halfway full of rocks or pennies. Shake the can every time your Yorkie barks while saying, "Quiet." Use a firm and forceful voice, but never yell at your Yorkie. When the dog is quiet, offer it a tasty treat and praise. Pick the Yorkie up when it barks, and look it in the eyes. Most dogs view eye contact as a sign of pack leadership. Do not look away from your Yorkie's eyes. Firmly tell the dog, "Quiet." Whoever breaks eye contact first is viewed as the subordinate in the dogs world. Do not break eye contact first. When your Yorkie finally looks away, place the dog back on the floor. Provide ample toys for your Yorkie to play with if the dog is home alone and barking. Many dogs bark from loneliness or simple separation anxiety. Try to make the Yorkie's surroundings exciting and interesting with different toys every few days. Walk the Yorkie regularly, and play often with your dog. Many Yorkies bark because they do not receive enough exercise, and they have pent-up energy. 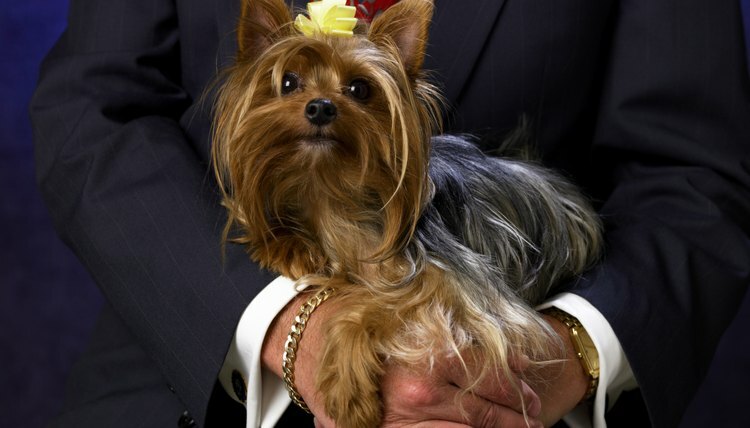 Enroll your Yorkie in an obedience class. Many people do not think about taking a small dog to obedience classes, but they are an excellent way to bond with your dog. Simple obedience will also help in controlling unwanted barking. If a Yorkie begins to bark, you can issue the sit command or lie down command to control the barking. Purchase another small dog or pet to keep your Yorkie company if the dog barks out of loneliness. This is an extreme move to make, and consider all factors before bringing another dog into your home. However, a companion often works wonderful to reduce barking from separation anxiety. Never hit your Yorkie. Never use a bark collar on a tiny Yorkie. This discipline method could emotionally damage your small dog. Yorkshire Terrier World: Need Some Help With A Barking Yorkie?